Former British Prime Minister Tony Blair has suggested that a study be conducted to evaluate the type of education that would be effectively suited for Pakistan and an urgent action be taken to implement it. He made the suggestion in a meeting with Arif Ali Shah Bukhari, Chancellor of KASBIT and Chairman of KASB Foundation, on the sidelines of the recently held YPO-WPO Global Leadership Conference in Istanbul, Turkey. Arif Bukhari, who attended the conference as Member MENA Regional Board of YPO-WPO, revealed that in the meeting with Tony Blair the geo-Political issues of Pakistan also came under discussion and he explained to the former British Prime Minister that there was great potential for improvement and modernization in Pakistan for which the way forward was through the prioritized provision of education to its masses through which the evils of illiteracy and violence would gradually be overcome. The former British Prime Minister agreed with the viewpoints of the KASBIT Chancellor having remarked there was also an urgent need to develop direct people to people contact for which finding of right partners between Pakistan and Britain was must to achieve real and sustainable growth. He also stated that the world’s growth and prosperity had always come through the private sector and that the government’s work was to give the right policies and to create conducive environments for educational growth. 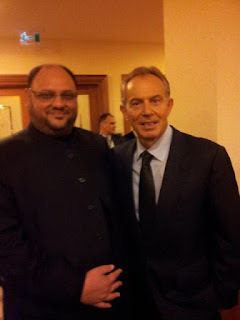 Tony Blair also informed Arif Bukhari that the British High Commission was trying its best to implement several programs that would directly benefit the people of Pakistan for which he look forward to the support of Pakistani business community to play a positive role for the realization of these programs.